AUDUSD extended its downside movement from 0.8135 to as low as 0.7042, breaking below 0.7085 support. 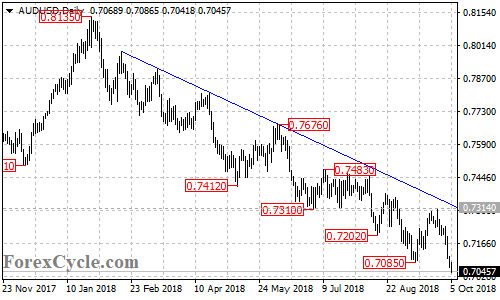 As long as the price is below the bearish trend line on the daily chart, the downside movement could be expected to continue and next target would be at 0.6900 area. Only a clear break above the trend line resistance could signal completion of the downtrend.